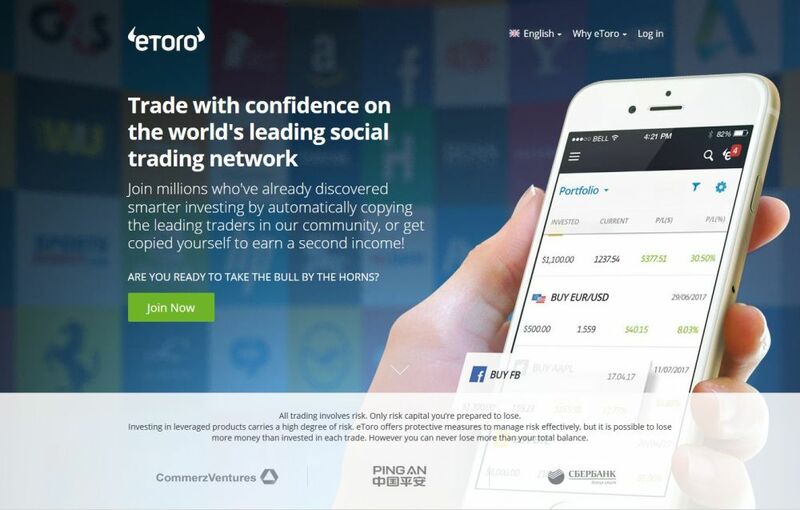 You might be familiar with the name eToro.com, the one with the “bull logo”? They have been storming the internet with their advertisements and how they are better than any other websites out their today that cater to online trading. Today we are going to look into what they have to offer as a website, as a broker, and of course, as a company. Their saying is “Your Social Investment Network” and let’s sees what that is all about. The website eToro.com was initially established way back in 2006 as RetailFX, which worked as a trading platform and was founded by Ronen and Yoni Assia (siblings) with their partner David Ring. After a few years later, these brothers along with their partner established eToro with the goal of creating a trading platform that would not only be diverse, but user-friendly to all levels of traders out there today. Their project, of course, attracted a lot of users which made them what they are today. What made them successful? Their “Copy Trading” feature is what stands out the most from any other trading websites out there today. 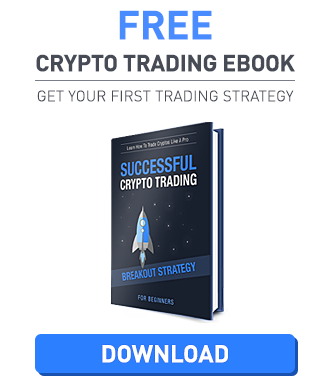 You are able to copy trades from the experienced traders that are registered users of the website, making it easier for newer traders to get an idea on how to successfully trade with patterns used by the professionals. We always need to make sure that a website that we transact with is of course, legit. When it comes to eToro.com and their regulations, they made sure that they had it covered. Before moving forward and knowing how to trade and creating an account, let us check their licenses first. Unlike any other common websites out there today, eToro.com is regulated within two separate jurisdictions, the UK and Cyprus. Not all broker websites out there today are registered in two jurisdictions, but is it bad? Definitely not! This makes it easier for people to trust them due to the bodies that regulate their transactions. UK – com (UK) Ltd. Is regulated by the Financial Conduct Authority (FCA) and retains a cross-border license from the FCA to offer its services in member states of the European Economic Area. Cyprus – The website is regulated by the Cyprus Securities Exchange Commission (CySEC) and retains a cross-border license from the CySEC to offer its services in member states of the European Economic Area and outside of it. You can read more about their jurisdictions through this link provided. Now that you have a good idea on what eToro.com has created for their name, it is time to create an account and try to trade! Hopefully, they do have a demo account that we are able to play with to experience what they have to offer without having to deposit real money into your account. 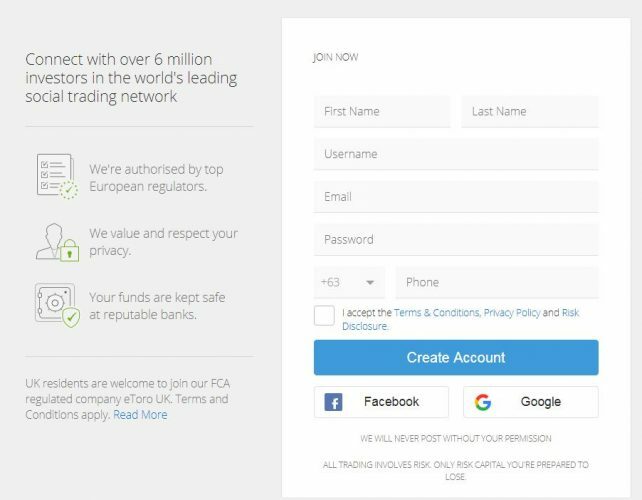 To create an account, we first need to head to their website, which is www.etoro.com and click on the green button on the lower part of their home page saying “Join Now”. Once you have clicked on the button you will be redirected to their registration page. On this page, you will be asked to fill out a form that includes your Full name, Username, Email, and account password including your mobile phone number. The registration is actually really fast! Once you have completed all the required information, you will be automatically redirected to their website and logged in. You do not even need to confirm any message that is sent to your email if you just want to use their Virtual trading platform, which we will be doing today. Once in your account, all you need to do now is to change from “Real Portfolio” to your Virtual one which can be done through the button on the left-hand side of the screen. 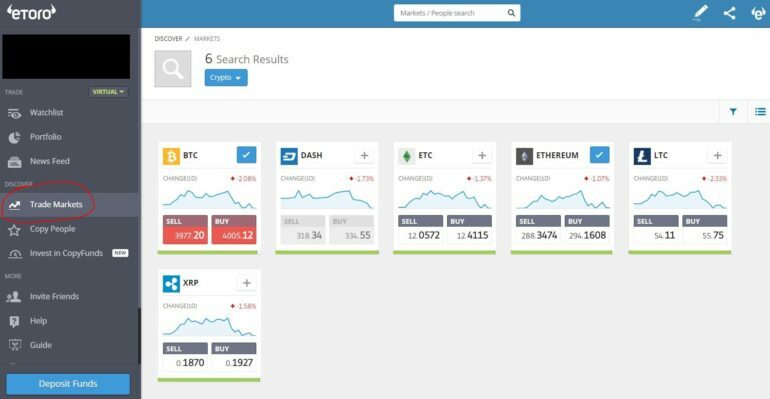 Choose a virtual portfolio and click on the Trade Markets so that we are able to look at their Crypto currency market. Please be advised that they have markets for ETFs, Stocks, Indices, Commodities, and Fiat Currencies. Today we will be looking into what they have which is Crypto Currencies. On the sample screenshot provided, you are able to see 6 available crypto currencies pairs to choose from. You are able to choose from BTC, DASH, ETC, ETH, LTC, and XRP. These are the crypto currencies you are able to test trade with against USD. To start trading, all you need to do is choose which crypto currency you want to trade. Today we will try to buy Ethereum since it’s looking good today. Once you click on BUY, this will open up a separate window with everything that you need in it. On this window you are able to see how much you want to purchase, how much is the equity worth, see how much leverage you’ve got, and control the loss and profit of your transaction. In other words, this is the box that you need to focus on. When the purchase is finalized, just click on Open Trade and this will automatically purchase the action for you. You then need to proceed to your “Portfolio” and look into what you have at hand. 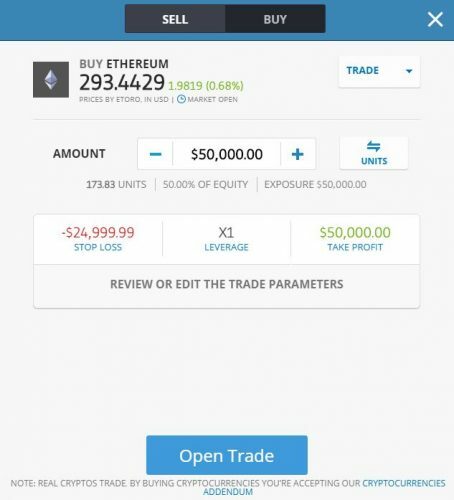 For our sample purchase of $50,000.00 we have 173.82 units of ETH that was bought for that amount of money and leverage. On the portfolio page, all you need to do to adjust anything of the trade is to click on the gear button located on the far right-side of the trade that you made. This will bring up the page wherein you are able to change your stop loss and profit options. You can also close the trade if you feel like you want to end it there and then. One of the features that make eToro.com a very awesome website is the ability for a registered user to copy trades and invest to the best market players of the website. Please be advised that the higher the number of the Risk rate, the higher the returns but of course, the higher the risks. Safe traders run at level 3 risk level. The Demo account that we tried has an initial deposit of $100,000 in play money. This means that you are able to play with their features without investing real money yet. This can also help you in the future to start and try out trading strategies that may be of useful to you in the long run. Please be advised that you are able to use all their services even with the demo account, take the opportunity to know the website better with the use of this feature! Below are the Spreads and Fees of the crypto currency trading that are happening within the website. Please put in mind that the fees are subject to change, to get the latest update on the fees and spreads please refer to this link for more information. In order to start transferring/withdrawing real money into and from your account, you will be asked to complete your account. This would include everything from your real name, DOB, and financial information. Minimum deposit is $200 and minimum withdrawal is $50. When it comes to withdrawing money from the website, the initial mode of payment would be the channel on which you are able to get your money out from. For example, if you deposited money using PayPal, that would also be your withdrawal method. Here at eToro.com, they consider your friends a part of who you are and want to reward you for this! This means that when you refer your friends to use the services of eToro.com, you will get $20.00 per confirmed referral. Not only will you take advantage, but your referred friend will also received $20.00 into your account as well. You can enjoy this advantage up to ten times. 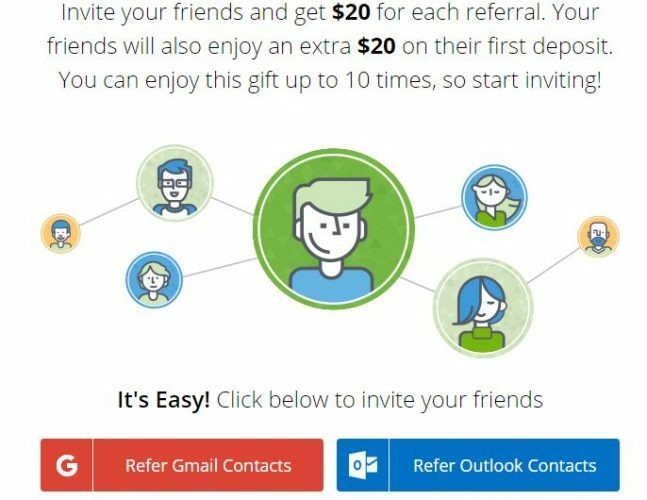 To refer friends, all you need to do is log into your account, go to “Invite Friends” button and start by using your Gmail contacts or Outlook. A good website should and always have the best customer support that one can ask for. Why? This is the channel that people look for in case they have problems with their account in general. The customer service here at eToro.com is available 24 hours a day and 5 days a week. They have email, fax, and phone support. They also have multiple Languages supported for our non-English speaking friends. No Bitcoin deposit and withdrawal supported! eToro.com is making noise in the internet today, this is because they have a website and platform that is really easy to use. You would not have a hard time knowing which is which and start trading. The added Demo Account is also of great use since this is not limited unlike any other trade websites today. You are able to trade, use all their services with even a demo account, which is great if you ask me! The minimum deposit fee is the problem since you need at least $200 to start trading real money. Some websites now offer $50 deposit, so they lost on this part. If you ask me, in general this website is really great to explore and start trading with. Not to mention, they have mobile trading available as well.